Below are notes taken from the 2017 tour. This was written for the group and gives more of a personal expression of the experience. Every tour is different and as a tour guide I help find a synthesis of the tourist abilities and interests to create the best experiences for all. Visit to Gorge De La Galamus and Ermitage de Galamus. Into the cave church for meditations. Cubieres Sur De Cinoble This small church was once part of an larger Abbey. The group responding by opening 5 energy centers, seeing the Knights Templar and Cathars being hid by the monks. The group worked well as a team. Part of the group went to Pic De Bugarach for a meditation while the remainder went home. Day 2 Thursday, June 22th. Church of St Polycarpe, people were mystified by the Mary Magdalene painting and unusual art images. Did group ritual together. Notre Dame De Marcielle Began by visiting the healing well on the pilgrimage walk to the church, we blessed each other with the water as well. Then entered in the Cathedral to see the Black Madonna and amazing artwork of the church. Vals The church in the hilltop of rock. We all placed our hands on the alter feeling it vibrate strongly and called in the stars, led by Becky. In the graveyard behind the church it was confirm the church had the power to be of a stargate, we opened the stargate energies. The entire day at Nebias Forest, Highlights going on the large healing rock, Labyrinth Vert, The Grand Lapiz and Sapin Harp. Tina lead channeling of Mary Magdalene. Then silent time in the masculine cave and Bart led spinal activation in the 3rd cave of the stars. Lunch at Jardin De Marie at Rennes Les Chatea Tina and Becky led a clearing of the church. Forest of Lavedoux spending time with the big trees, felt like the vail was thin between the fairy and elven worlds here. Route De Marie A double vortex and much more. An opening of all possibilities to transform. In addition, a gateway into cosmos, possible entryway for the great spaceship or landing place. Church of St Salyvre Place of possible death place of Jesus. Other energy spots were found but not exactly understood, maybe burial place of Joseph of Arimathea and Jesus. Much suspected but unclear. Foot soaking at Alet Les Bain and tour of the town, visited Nostradamus’ home, statue of Athena and Medusa and old Roman administration buildings from 3rd century. Cave de Cauna AKA Cave de Perillos, large cave in the desert. Meditations and lunch in cave. Chateau De Perillos possible burial place of Jesus, meditation post-poned due to rain. Short stop at Ville de Padern. Carcassonne, visit of Cathedral to find templar spirits, possible burial place of Jesus and an Alien. Second visit to Cubieries Sur La Cinobles, completion of opening of the church. Canceled walk up to Mt Cardou due to rain, instead visit to Serres to connect to Mary M and the mountain in a park area. Saw rainbow beside Pic De Bugarach then dead fox alongside the road. Powerful symbols of transformation. Visit to Fountain De Amour and Mary Magdalene Baptismal spot at River Sals. Visit to Esperanza as Debbie connected to a necessary energy of a large tree. Notre Dame De Quillan a church dedicated to Mother Mary. Complete activations at Route De Marie in the forest. It was perceived of a large crystal structures, lay lines and water aquifers work together to energize the lands in general. In this place, the Atlantians aligned the the energy sources but through time were not so clear. The group aligned many of the energies together. 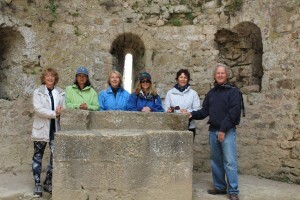 Chateau De Payrepertuse at Iglese De La Marie, we all gathered at the alter place to reconnect it to a deep energy within the earth, “The sisters of the caulderon of light” bringing up the energy to this ancient power spot, likely much older than the church, thousands of years old.